So I mentioned earlier that I was entering recipe contests. One contest is for North Carolina Sweet Potatoes. 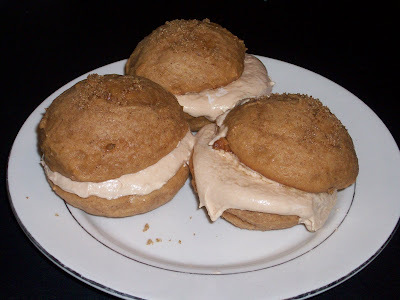 I created a butterscotch sweet potato sandwich cookie a butterscotch cream filling. These cookies are so rich and full of flavor that you will defiantly need a glass of milk! Mix all dry ingredients and three tablespoons of the brown sugar together, making sure there are no lumps. Slowly beat in eggs one at a time making sure each egg is mixed in thoroughly. Blend in oil and then sweet potatoes. Use a tablespoon and scoop batter out and place evenly apart on a cookie sheet that has been lined with parchment paper. Preheat oven to 350 degrees. Sprinkle cookies, evenly with remaining brown sugar. Bake at 350 degrees for 8-10 minutes, or until cookies spring back when touched. Remove and allow to cool completely. In a bowl cream butter and powdered sugar, and then stir in vanilla. Melt butterscotch morsels and milk in a double broiler, until creamy. Blend melted butterscotch with sugar mixture until smooth. Fold in marshmallow cream. Spread filling on one cookie, top with another cookie and enjoy.